A popular journalist and blogger who won readers over with his irreverent diary chronicling his battle with a brain tumour has died aged 44. 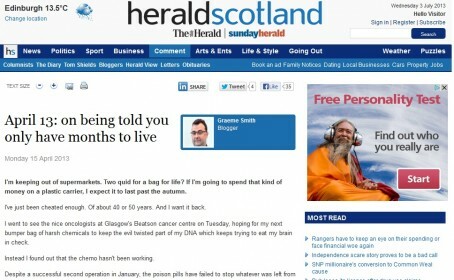 Graeme Smith, content editor for the Herald & Times Group’s s1 series of websites, launched his ‘Hole in the Head’ blog after was diagnosed with the illness at the end of 2011. He died on Sunday, having raised £4,000 for charity in his final months, and is survived by his wife Clare. Graeme, pictured, began his career as a teenage copyboy on the Evening Times, going on to become an editorial assistant on Scottish Field and Environment Now! Magazines before finally securing a reporting position on the bi-weekly Alloa Advertiser in 1989. There, he soon became chief reporter, despite technically still being a junior. In 1992, he moved to the Falkirk Herald, and seven years later joined Scotsman.com as an online journalist, before becoming channel manager with responsibility for setting up its heritage, travel, recruitment and education sites. He joined the Herald and Times Group in Glasgow the following year, working on the s1 series of websites. As content editor, he became responsible for more than 100 different sites. A full obituary to Graeme has been published on the Herald website, as colleagues paid tribute. “Graeme was one of the longest-serving employees in s1, having worked here almost from the beginning,” he said. “He was a gifted writer with a sharp dry wit, a talent he brought to bear most poignantly in the blog detailing his life after being diagnosed with brain cancer. Graeme’s final blog posting was in April, when he revealed he only had months to live after doctors found the chemotherapy had not been working. In it, he wrote of the dreams he wished he had been able to achieve, but also how he planned to make the most of his time left. “I would turn 45 this year. Given my generation, my social background and the relative longevity of my family, I was expecting to see my 90s,” he wrote. “I had plans: I wanted to be a published author; I wanted to be a dad; I wanted to grow old with Clare; I wanted us both to travel more extensively than we have. “I’d even have quite liked to have finished learning to play the guitar properly. Circumstance is such a swindler. He added: “I have some time left, and I will make the most of it. Of course I’m afraid of dying, but of the process, not the aftermath. “I will remain me until the end, and I will not waste that time on self-pity and fear. And I will fight with every resource at my disposal. I have a strong mind, and I’m not planning on going anywhere gently. What an extraordinary man – and what a marvellous legacy too.